Since the Dietary Goals for the United States were published in 1977 suggesting everyone increase their carbohydrate intake and decrease their fat intake, has there been any evidence to support this recommendation? Find some and win money. 2. Submit them by email to info@awlr.org. 3. Donate to the pot and increase the stakes. After the challenge has concluded, the person(s) who find such trials will win a 40% of the donation pot. The remaining 60% (or entire pot if no winners) will be donated to the Nutrition Science Initiative*. In February of 1977, the first ever Dietary Goals for The United States were released, in response to the fact that "six of out ten of the leading causes of death have been linked to our diet." The Government, the report explains, "has an obligation to acknowledge this. The public wants some guidance, wants to know the truth, and hopefully we can lay the cornerstone for the building of better health for all Americans, through better nutrition." What ensued for the next 35 years was the largest increase in obesity the world has ever seen. In fact, because I recognize many will read or hear only about the Dietary Goals….I feel the American public would be in a better position to exercise freedom of dietary choice if it were stated in bold print on the Goals and Food Selection pages that the value of dietary change remains controversial. And that science cannot at this time insure that an altered diet will provide protection from certain killer diseases such as heart disease and cancer…I recognize the desirability of providing dietary guidance to the public ... In my judgment, however, the best way to do this is to fully inform the public not only about what is known, but also what remains controversial regarding cholesterol, the benefits of dietary change, and the reliability of food intake data. Only then, will it be possible for individual consumers to respond optimally to the Dietary Goals in this report. Over the past 35 years, has there been any randomized clinical trials supporting the use of the low fat, high carbohydrate diet recommended by these Dietary Goals, as opposed to a diet low in carbohydrates? Meta-analysis carried out on data obtained in 1,141 obese patients, showed the Low Carbohydrate Diet to be associated with significant decreases in body weight (−7.04 kg), body mass index (−2.09), abdominal circumference (−5.74 cm), systolic blood pressure (−4.81 mm Hg ), diastolic blood pressure (−3.10 mm Hg ), plasma triglycerides (−29.71 mg/dL), fasting plasma glucose (−1.05 mg/dL), glycated haemoglobin (−0.21% [95% CI −0.24/−0.18]), plasma insulin (−2.24 micro IU/mL) and plasma C-reactive protein, as well as an increase in high-density lipoprotein cholesterol (1.73 mg/dL ). Low-density lipoprotein cholesterol and creatinine did not change significantly, whereas limited data exist concerning plasma uric acid. After 10 months, the low carb dieters lost more weight than the low fat (LF) group (20 pounds vs. 10.9 pounds) and more fat (12 pounds vs. 5.7 pounds in the LF group), despite reportedly eating the same amount of calories. After 4 weeks, the high protein, low carbohydrate diet resulted in more weight loss (13.9 pounds vs. 9.4 pounds in the medium carbohydrate group), significantly less hunger, while spontaneously consuming 167 less calories each day. Atkins group lost the most weight (13.2 pounds at 6 months, 10.3 pounds at 1 year); Systolic BP significantly lower at 12 months. At all times, HDL and triglyceride levels favored the Atkins group. Comparison of high-fat and high-protein diets with a high-carbohydrate diet in insulin-resistant obese women. High fat and high protein groups had significantly greater reductions in weight, waist circumference, and triglycerides. Insulin decreased in all 3 diets. Energy intake did not differ between groups. A low-carbohydrate, ketogenic diet versus a low-fat diet to treat obesity and hyperlipidemia. Calorie unrestricted, low carbohydrate diet group had greater weight loss (12.9% of weight vs. 6.7% in low-fat), greater loss of fat mass (-20.68 pounds vs -10.3 pounds), greater decreases in triglycerides (-74.2 mg/dl vs -27.9 mg/dl), and greater increases in HDL (5.5 mg/dl vs. -1.6m mg/dl). A randomized trial comparing a very low carbohydrate diet and a calorie-restricted low fat diet on body weight and cardiovascular risk factors in healthy women. Very low carb group lost more weight (18.7 lbs vs. 8.5 lbs) and more body fat (10.5 lbs vs. 4.4 lbs) than the low fat group. No difference between diets in blood pressure, lipids, fasting glucose and insulin. A low-carbohydrate as compared with a low-fat diet in severe obesity. Subjects on calorie unrestricted, low-carb diet lost more weight on average (-12.76 lbs vs. -4.18 lbs), and greater decreases in triglyceride levels (-20% vs. -4%) as compared to low-fat diet. Insulin sensitivity (measured in non-diabetics only) also improved more on low carbohydrate diet (+6% vs. -3%). The low carb, ketogenic diet (LCKD) group had greater improvements in hemoglobin A1c (-1.5% vs. -0.5%), body weight (24.4 pounds vs. 13.8 pounds), and high density lipoprotein cholesterol (+5.6 mg/dL vs. 0 mg/dL) compared to the low glycemic, reduced calorie diet (LGID) group. Low carb group lost more weight (10.3 lbs) than the low fat group (6.4 lbs) and slightly more than the mediterranean diet group (9.68 lbs). The role of energy expenditure in the differential weight loss in obese women on low-fat and low-carbohydrate diets. Very low carb group lost more weight (21.5 pounds vs. 13.4 pounds in low-fat group) and more body fat (13.6 lbs vs. 7 lbs on low-fat). No difference in energy intake between groups. After 3 months, compared with the NCEP diet (fat (30%), carbs (55%), and protein (15%)), the low carb diet resulted in significantly more weight loss (13.6 lb) than in the NCEP group (7.5 lb). Men on VLCK diet performed significantly better in weight loss (-17.6 pounds vs. -10 pounds), total fat loss, and trunk fat loss, despite consuming slightly more calories (1855 kcals vs 1562 for LF). Women on a VLCK diet also performed slightly better, but it was not significant. Subjects on calorie unrestricted, low-carb diet lost more body fat at 3 months (-6.8 % vs. -2.7%), and at 6 months (-7% vs. -3.2% in the low fat group). At 12 months, difference was not significant. HDL increase and triglyceride decrease were larger on the low carb diet. 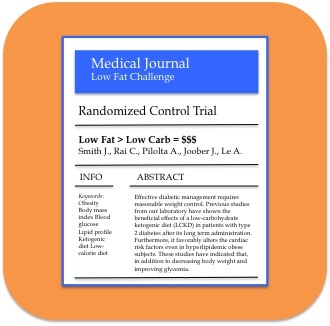 Randomized trial on protein vs carbohydrate in the ad libitum fat reduced diet for the treatment of obesity. After 6 months the low carb group lost more weight ( 19.58 pounds vs. 11.2 pounds) and lost more fat (16.7 pounds vs. 9.46 pounds) than the high carbohydrate group. 35% of subjects in the low carb group lost more than 22 pounds compared to only 9% in the high carb group. Only the high protein, low carb group significantly decreased their triglyceride levels. Donate to NuSi and increase the stakes of the Low Fat challenge. 100% of donations will go towards this challenge and to the Nutrition Science Initiative. Share this challenge with your friends and spread the word. If the standard of care is a low fat, high carbohydrate diet, then randomized clinical trials should exist supporting it. Randomized Control Trial comparing a low fat, calorie restricted diet to a low carbohydrate diet, with or without a calorie limit. Statistically significantly greater reduction in weight and/or fat in the low fat group as compared to the low carb group. Note: many trials exist showing no difference between groups, and they can be viewed in our research library. Sample size should contain no less than 15 subjects in the experimental group (or 15 total if it is a crossover design). 100% money will be donated and no donations will go to the Ancestral Weight Loss Registry. If after 6 months (time period subject to change) no one has found a low fat diet trial that trumps low carb and meets the criteria, all the money will be donated to the Nutrition Science Initiative. If trials are discovered that do meet the criteria, 40% of the donation pot will be divided equally among the winners, and the remaining 60% will go to NuSI. Nutrition Science Initiative (NuSI) does not solicit or actively endorse third party fundraising on its behalf. Nutrition Science Initiative makes no representations or warranties regarding the tax implications of contributing to NuSI through a third party fundraiser, and expressly disclaims any implication that donations made payable to a third party fundraiser are tax deductible as a donation to NuSI. Funds raised can be used to provide unrestricted support or can be designated to support a particular institute or particular program or area. Use of Nutrition Science Initiative’s name, logo, photo, website or proprietary information, stationary in any mailing, advertising, or downloading of NuSI logos from the Internet use is not permitted without express written approval from NuSI.